Image Access designs and manufactures a range of large format scanners, including the Bookeye planetary scanner and BS software products. 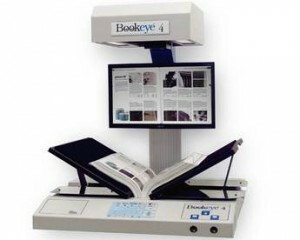 The Bookeye scanner scans bound books, or newspapers and large documents up to A1 in size. The curvature inherent in some pages of books when opened can be removed by the BCS software, resulting in high quality, ‘flat’ images of printed book pages. As well as selling and supporting these scanning systems Infoscan offers a bureau service with the Bookeye 3 A1 scanner for bound books, fragile archive papers and newspapers and clippings, documents which are not suitable for a normal document scanner.